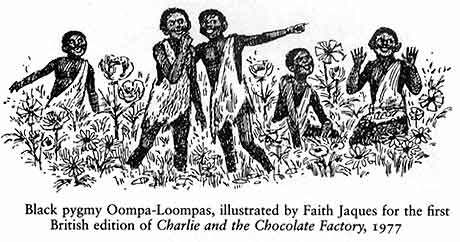 Should I do a postcolonial reading of Willy Wonka or can I just enjoy the songs? 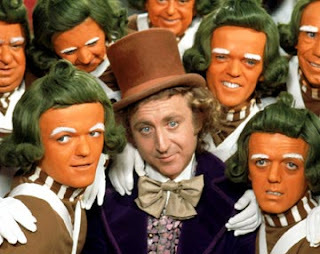 So I was channel surfing last night and came upon the vintage Willy Wonka and the Chocolate Factory -- the one with Gene Wilder being slightly creepy (of course, it could just be the hair and eyes). It was early in the film when the kids are frolicking in the candy garden with the chocolate waterfall--Wonka is singing that song "Pure Imagination" and all is sugary bliss when Southern Man asks, "Hey, how come there aren't any black people in this film? Where are the people of color? 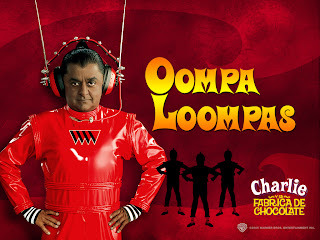 Are the Oompa Loopmas supposed to stand in for them? And isn't that racist?" Now part of my reaction was "Darn it! You stole my line!" I mean, that's usually ME going on about representations of race and racialization and white supremacy. And especially remembering the illustrations from the original I read as a child and the story that Wonka tells about "saving" the Oompa Loompas and that they love working at the factory for free as long as they can eat cocoa beans....well, it's a tale redolent with exploitation and racial hierarchization. The lack of people of color is part and parcel of the way films were made in the 1970s and part of the larger problematics of the world in Dahl's novel. But here's the rub: I love Roald Dahl's novels. And I love the Willy Wonka film--as problematic as the underlying narrative of exploitation is. And in an odd reversal, I was the one telling Southern Man that I didn't want to think about these things and just wanted to watch the movie (it has been a hard few weeks...more on that later). But still. I can't turn off that part of my brain. Hence this blog post this morning. 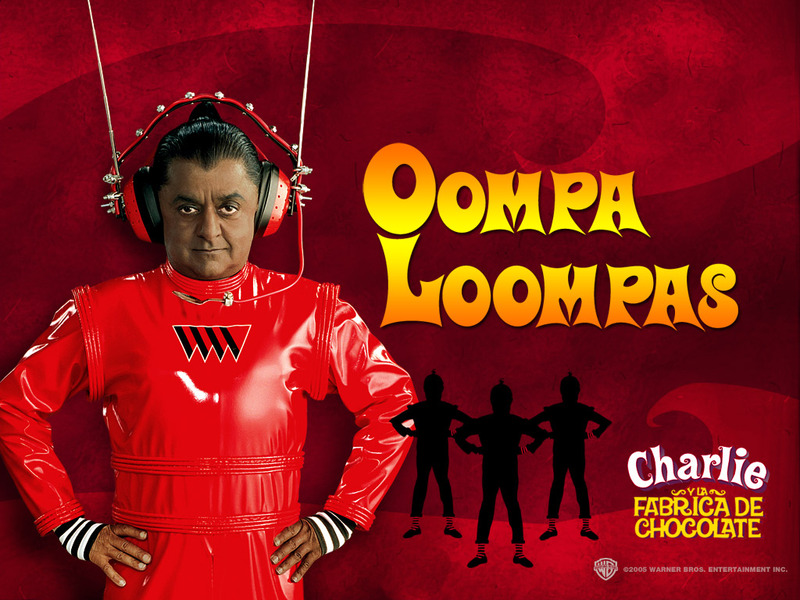 And of course, even with the update in 2005 with Johnny Depp filling in for Gene Wilder, we still get the cloned image of a dark skinned man as the oompa loompa par excellence. That Southern Man...he puts me to shame with his spot on analysis of race and popular culture. Gotta get my A game on. Today is Earth Day, and I do think that if Mixed Race America had a sponsoring color then perhaps it would be green, not because people who claim to be "colorblind" use "green" as their default racial mode (as in, "I accept all people, black, yellow, red and green! "), meant to signal their racial inclusivity but which, instead, seems to be about a rhetoric of multiculturalism that doesn't really interrogate racism. Anyway, if you are interested in what you can do, not just for today but for every day, here's a page for Earth Day events. One thing, very small I know, that I have begun doing is making everything digital in terms of my classes--the articles we read, the assignments on Blackboard, and the papers that my students send me as attachments. I know, totally tiny in the scheme of things. But you have to start somewhere. Speaking of starting somewhere, I think many of you know about what the Texas State Board of Education has been advocating about the way American history should be taught to the children of Texas. Yet this isn't just about Texas since so many text book publishers are located in Texas and steer the content of their textbooks (esp. History) based on the recommendations of the Texas State Board of Education. So the recent conservative majority on the board, and their changes in terms of how American history should be taught (de-emphasizing slavery, making social change seem like something granted by the majority to the poor minorities, and talking about Italian and German nationals being interned along with Japanese Americans during WWII in order to de-emphasize the egregious unconstitutionality of the Japanese American internment) is something we should all be VERY CONCERNED ABOUT. What can you do? Stop by the ACLU website (click here). You can sign a letter to the board. Will it work? I don't know. But it's something small that you CAN do and that MAY just help--and lets face it, we all have to try to do what we can, whenever we can. And if you can do more--if you can send this out to your friends or on your blogs. If you can get more media attention on this issue or provide a corrective to the conservative misrepresentation of history that Texas conservatives want to shove down the nation's throat--then please JUST DO IT! I've been doing a lot of flying lately. As I write this, I'm sitting in a hotel room in Connecticut, having given a university talk the day before. I'll be flying back down south later today and I've thankfully been seated next to folks who do minimal to no chit-chatting with me, which I'm grateful for. Anyway, I'm mentioning this because being in airports and being on airplanes make me anxious and slightly racially paranoid. I suppose this requires clarification because for someone who doesn't know me, they may think that I've succumbed to the war on terror and am clutching my shoulder bag around any middle-eastern looking person. This is not what I mean. I am anxious because I hate flying. I mean, partly it's the hassle of it all, but really it's the smell of the airplane, the fact that I suffer from motion sickness, and the unreality of hurtling my body through the air in a big metal tube. I wouldn't call it a fear of flying...yet, but I am aware that I am making myself do something that defies the law of gravity and common sense. Yet I do it regularly (along with billions of other people). And lets not talk about my sense of guilt over the carbon footprint I've been leaving lately. And I'm not being sent weekly to meetings like some of my friends, so in the scheme of things I know I'm not solely responsible for killing our planet. But I don't think I'm helping either. But the racial paranoia? Well, airports in the U.S. (where I do almost all my flying to and from), aside from the TSA screeers on the west coast (predominantly Filipino) and the South (largely black), are almost all white spaces. And that kicks in my racial paranoia--my sense of being a non-white person in this tension filled atmosphere and just being hyper-aware of my difference and the way I am perceived and the way I perceive others. Which I one reason I don't want to break the bubble of silence--that natural silence that exists in airport waiting rooms and among many passengers on board a flight. You sit next to a stranger and you might smile or say good morning, but you both stay contained within your own bubbles, maybe putting on a head set if there's a movie or your iPod when it's safe to open your portable electronic devices. You don't make eye contact. You keep your legs and arms inside the prescribed area of your assigned seat. I guess I'm thinking of this because the last trip I took--flying home from Austin, TX after my conference--I overheard this older white, retired couple talking to a woman directly across the aisle from me. I was honestly not trying to eavesdrop. But it's hard when the plane is about to take off and you're just waiting on the tarmac and the people across the aisle are talking really loudly. This guy, a Korean war veteran who spent time in Japan, was describing his various travels in and out of Asia and describing life in Japan. He didn't say anything terrible, but I felt myself unusually tense because I was just WAITING. Waiting for him to say the really racist horrible thing that would force me to decide whether this is a moment in which I want to say something while trapped in my seat across from him for a 3 hour flight. I suppose one could ask who died and made me Captain Righteous (which, by the way, if I had a superhero name would probably suit me to a "T"--not that I'm necessarily proud but I'm definitely aware of how I can get), but I decided, long ago, that I hated having that feeling in the pit of my stomach whenever I was around someone who said something really terribly offensive--esp. about Asian Americans or Asians--because I feel like Asians are such an invisible presence in public discourse. But like I said, it never happened (although he did make some very disparaging anti-Obama comments to the young woman who said she was from DC and a Mount Holyoke alum (GO MHC! ), which I though was particularly rude because the woman, when asked by the veteran, said that she really liked Obama and voted for him and campaigned for him. And then he huffed a bit and said that he didn't like him one bit and proceeded to tell her why! ACK! The woman got very quiet and it was at that point that I broke my own rule and told her that I had once taught at Mount Holyoke and we had a nice brief chat and the vet's wife poked him and I think made him see that he had been rude and so when I retreated back to my bubble, the wife began to talk to her about something totally different and at that point it was safe to use our portable electronic devices, so I turned on my iShuffle and went back inside my bubble. Lets hope for safe travels for me today and no one making any anti-Obama/tea party comments (that was the vein of the guy's remarks) or any anti-Asian comments that will require me to get righteous and then feel awkward during my two hour-long legs of my trip. There are lots of reasons I find this ad creepy. The obvious has to do with the deceased and disembodied voice of Earl Woods. And perhaps it's also the face of Tiger, gazing out at the audience, chastised and chastened by the words of his dead dad. But really, what is creepy is the need that Nike felt to produce this ad in the first place--that Tiger needs a very public chastisement to receive redemption. That we need to publicly flay Tiger for his sins. Now, I'm not trying to defend Tiger Woods on any kind of ethical or moral grounds. But I've been doing research about golf and in particular about Tiger for a few years now, and as you can imagine, golf is a very male dominated sport--a very straight male dominated sport. I mean, you gotta figure statistically there'd be a fair share of gay pro golfers, but in all my research I've never heard of any golfer coming out after the tour let alone during his time on the tour. And the stories of Arnold Palmer's womanizing (and there are many other golfers who are married who have had their fair share of affairs if half these rumors are true) makes me wonder why Tiger has been such a lightening rod. Did we really expect him to be more than he was? Well, the truth is, we and perhaps I should say "I" had hopes that he would be. And what I mean is that I have always wondered whether Tiger would take on social justice issues, especially around race and racism, since he has been someone who has certainly experienced his fair share of racism, whether he has recognized it as such. And he has certainly known what it's like to walk in a world of extreme privilege. So I find the shaming of Tiger and the apology making on his part to be fascinating and troubling and creepy--not just because it seems designed to recuperate his "brand" and thus make money for Nike or Tag Heurer or any other corporation, but because the idea that the white golf establishment (and it IS a white golf establishment) needs to publicly shame the only pro golfer of color reminds me of the days of the PGA and its Caucasian-only clause in effect through most of the 20th century. Anyway, I know, it's not an uncomplicated issue and not many people feel bad for Tiger, but from a racial point of view, I think that the need he has felt and others have felt to continue shaming him says a lot about the investment that golf has in keeping Tiger checked. Well, I'm back in my small Southern college town after spending time in the big city of Austin, TX. I say "big city" because honestly, compared to my tiny town (and I do live in a town rather than a city) Austin has a discernible skyline, multiple neighborhoods, and a large population (which really is, demographically, what distinguishes cities versus towns). I have to say that beyond thinking that the conference was really like a homecoming for me, I also liked the city. It is a great eating city, wonderful music, and a fairly large and visible Asian American population, unlike where I currently live. But back to the topic of this post, what exactly is too much information to share on this particular blog? It is a question I've wrestled with from the first months of writing this blog. It really came to a head when I found myself embroiled in a lot blogosphere drama that took a nasty turn when commenters and readers of another blog actually contacted me through my university email and on my cell phone to vent their vitriol at me. So I took the blog off-line for a few months as a reader-invite-only blog and then went public, again, after I thought that the drama had died down, but in the meantime I had taken off all identifying markers of who I am, where I live, the people I'm close to, and the university I work at. However, while I think these were all practical things to mask my identity (rather imperfectly I should say. While I don't want to encourage anyone to do this, it doesn't take a detective to figure out who I am--just a few key google terms), I've also wondered how much I should disclose of a more personal nature--or rather, how much of me I should discuss that isn't related to the topic of this blog--mixed race America. I also know that some of you who are reading this are folks who know me quite well, some are colleagues and acquaintances, and others I've grown to know through the blogs that you write and that I've commented on. I know I return to this topic from time to time, but I suppose I'm mentioning this again because there are things of a personal nature happening to me--things that could and are, in fact, bloggable in terms of what they say about my racialized and gendered identity or that deal with issues of race/racism/white privilege. But I'm just not sure how much I should disclose--how much would be considered "too much information" either on my part or yours. So I'm soliciting feedback from readers, especially those of you who blog yourselves. Where do you draw the line about what you share on your blogs. And readers, how much do you really want to know about the blogger if you are coming to a blog to read very specific information or perspectives? And don't worry--I have some blog posts in mind once I'm able to get underneath the mountain of work and email. And I do think that I'd like to post some information about future conferences that those of you who are in academia--or even those of you who aren't but who may be interested in the topic--would like to attend. And I've been wanting to do a long post about Tiger and about golf--or perhaps several posts, because there is that ad--which warrants much discussion--and the way in which Tiger's return to professional golf and his damage control has been perceived by the general public and by the institution of golf itself. So much to blog about, so little time! Labels: how much information is too much information for me to share with all of you? As the title of my post says, I am with family. My Asian American academic family. As I write this, it is day 2 of the annual Association for Asian American Studies conference, held this year in Austin, TX. I'm staying at the Omni hotel (very swank) and spent a full day, from 8am to midnight going to meetings, listening to paper presentations, taking part in discussion, both formal and informal, and seeing old friend that I only get to see once a year at this conference. I say I am with family, because that's what this feels like. A return to a safe zone, a comfort zone, with people I have a long history with, who care about me (and I care about them) and who engage me in an intellectual manner as well. And quite frankly a few of these folks literally look like members of my family! At one dinner I was sitting across from a woman who looks just like the mother of a close friend. And a few seats down another woman is the spitting image of my cousin! You walk around the hotel and you are awash in a sea of Asian faces, Asian American people. And it's really and truly wonderful, for me, as someone who is used to seeing lots of Asian American folk (remember I grew up in CA) and who now lives in "the South" in an area that doesn't have a large Asian population. So for those of you looking for new blog content or posting comments that take 12+ hours for me to moderate, please forgive me. I'm with family and am trying to milk the time here for all its worth, catching up with people, listening to some brilliant papers, getting into all sorts of conversations and discussions with folks about things I'm passionate about--and we share a short hand! The people who come to AAAS are for the most part scholar-activists--we came to this field because of our shared passion for social justice and anti-racist work and a desire to make Asian American a visible and legible presence in U.S. society. And on a different note, for those of you who have never been to Austin and who may be wondering what the city is like, from an eating point of view I am having a GREAT time--well, I'm an omnivore, so that helps, but seriously I had some beef brisket and pork ribs last night that just made my mouth so, so happy! I love yummy food! Last week Thursday, on April 1, after seeing the kind of prank that Google was playing by changing their name to Topeka, I decided to pull my own little joke by writing an April Fool's post that announced that I'd be changing the name of my blog from Mixed Race America to One Race America, and I explained the rationale for the change by citing the standard cliches that people use to discount the idea that racism still prevails as an underlying system of oppression in U.S. society and culture. I assumed most people would understand that I was clearly being facetious/joking/not serious. And many regular readers did realize that it was part of an April 1 prank, even if their initial reaction was one of horror and disbelief (to my regular readers, sorry for the scare but glad you realized that I would never seriously espouse those sentiments!). What was interesting were the comments from non-regular readers or first-time readers (since I don't recognize the commenters I'm not sure if they only recently discovered this blog or somehow stumbled upon it for the first time). For these folks, who clearly came to the blog intrigued by the name and hoping to find some dialogue about race, it must have been so disappointing and shocking to read the kind of trite platitudes about race that tells us we should stop talking about race because it only upsets folks and that if we ignore race then racism will disappear because those of us who are constantly mentioning race and racial issues are the real racists. We have all heard this kind of nonsense. I've been called a racist numerous times in the past few years, and each time I just look at the person and think "Really???!!! YOU are calling ME a racist???!!!" because I have to say that in the last few years the person calling me a racist was always a white person and they were telling me that my mentioning of race and racism was the real problem. It is a pretty thought--that if we just stop talking about race then racism would disappear. Problem is: we've tried it, and to the best of my knowledge, it hasn't helped. And saying love sees no color is ridiculous. Of COURSE love sees color. Love is not color blind. Neither are people. The thing we should say is love sees ALL colors and doesn't CARE what they are. Or shouldn't care--I mean, lets face it, since it took the Supreme Court to protect this right, inter-racial marriages and unions are a relatively new thing, and those who openly identify as mixed-race have also only had the last 2 census counts to really make themselves understood as such. As the title of my post says, we've always been a mixed race America. Whether by blood quantum or simply through proximity--by having friends, neighbors, loved ones, people in our community, in our nation--we've always been a multiple people. And I include the original inhabitants of this land as well--Indigenous Americans were never monolithic either--the Navajo, Inuit, Cherokee, and Ogonquin are all very different tribes. And in the 21st century we find ourselves aligned in various tribal units, by ethnicity and race, by gender and sexuality, by class, region, culture. But that doesn't mean we all still can't get along and that we shouldn't all still try to get along. However, getting along means we need to understand that some of us have more privilege than others--wield more power than others--have more access to resources than others. Only by recognizing this can we then claim a common humanity through our shared differences. Just so that there is no confusion, yesterday's post was in honor of April Fool's Day. I was assuming that regular readers of this blog would understand the obvious tongue in cheek nature of what I was writing and that my jester hat was solidly askew in writing what I did, especially given the previous post entitled "I'm a Race Woman." But I also understand for first-time readers, it seemed like an all too common apologia for how we shouldn't talk about race and should only think about race in terms of an "It's a Small World After All" mentality. So let me be perfectly clear: I was mocking that attitude in yesterday's post. I certainly DO NOT believe that we should not talk about issues that we find problematic, and especially for the theme of this blog I think it is IMPERATIVE that we create spaces to talk about race--to argue about race--to disagree in a respectful manner about race--to be empowered by a discussion of race and how to combat racism and white privilege and white supremacy--and to do so with an awareness of the intersection of other "-isms" that impact our understanding of racial identities and communities. For regular readers, thanks for putting up with my little prank--and glad you caught on to it! And for first time readers, please read my previous posts--I think you'll quickly catch on to why everything I wrote yesterday was appropriate for an April 1 parody. I've been struggling, lately, with feelings of doubt and confusion. When I started this blog over two years ago, I was so certain about my passion for the topic I was writing on. But over the last few months I've realized that my previous musings have actually been masking a deeper truth, one that my conscience must declare to everyone today. So. Inspired by google, I've decided that I need to change the name of this blog to reflect the true beliefs that I hold about race. From now on, this blog is going to be called "One Race America." Because I think Stephen Colbert really gets it right. He doesn't see race and neither should I. After all, we're really just one race, the human race. Why have I been promoting the idea that there's actual racial diversity?! HOW ABSURD! I mean, every time I talked about race what I was really doing was perpetuating divisions and highlighting differences between people. And I know I've said previously that noticing difference was fine--it's the hierarchies we create that cause problems with respect to racial categories. But I realize now I was wrong. Every time I talked about race I was really promoting the idea of racism. And I know I've written previously that racism caused race--but I was wrong. I see that now. I see that talking about race just makes people feel bad, and making people feel bad is what actually harms us. Especially white people. People of color should stop making white people feel guilty for things that aren't their fault. I mean, they weren't alive during the relocation of American Indian tribes or the transatlantic slave trade or the Chinese Exclusion Act or the Mexican American war. It's not their fault. And people of color, I apologize to you especially for perpetuating a mentality of victimhood. Remember: love sees no color. Why look back at the past and worry about what happened to your ancestors or your parents or the childhood insults and taunts. Or your co-workers strange remarks and glances. Just stay positive! Focus on the future! If you bring up your feelings, then you only leave yourself open for others to call you a racist for mentioning race, so it's better to just hold all those feelings in and find a more productive outlet. Like needlepoint. Or water polo. So remember. Today this blog is ONE RACE AMERICA. So when someone shouts a racial epithet at you or you were mistreated in a restaurant and you suspect it had to do with the differential melanin condition between you and your server or people look at you and your phenotypically different partner, remember, it's not because of race. You just need to move on and not worry about such things. And whatever you do, DON'T TALK ABOUT IT. Taking about race only makes things worse!